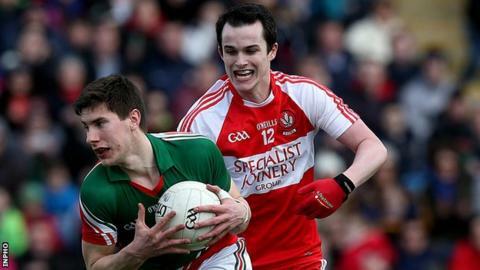 Mayo and Derry will meet again in the Division 1 semi-finals next weekend as the Connacht champions easily defeated a second-string Oak Leaf line-up. Derry boss Brian McIver made 14 changes from last weekend's win over Kildare and the new line-up struggled early on as Mayo led 0-8 to 0-1 by the interval. Alan Freeman's goal extended Mayo's lead to 1-8 to 0-2 before Emmett McGuckin's goal cut the margin to four. However, Freeman's second goal ended any prospect of a Derry comeback. Freeman's goal meant that he finished with an impressive match tally of 2-6. The win meant that last year's beaten All-Ireland finalists pip Tyrone for a place in next weekend's semi-finals. With Derry having already secured a last-four berth, McIver used the match to have a look at other members of his squad. However, following Sunday's performance, the Derry team is likely to revert to more familiar lines for next weekend's return contest with James Horan's outfit. Mikey Sweeney, Darren Coen and Tom Parsons were among Mayo's other first-half scorers with Aidan McAlynn notching Derry's only score before the break with a 19th-minute effort. A rout looked a possibility when Freeman's penalty extended Mayo's lead to nine early in the second half but Derry did summon up something of a revival as substitute Aaron Kerrigan and Charlie Kielt got on the score-sheet before McGuckin, who had moved from midfield to full-forward, notched a goal. The helped cut Mayo's lead to only three with 15 minutes left but Freeman's second goal then put the Connacht champions back in firm control.